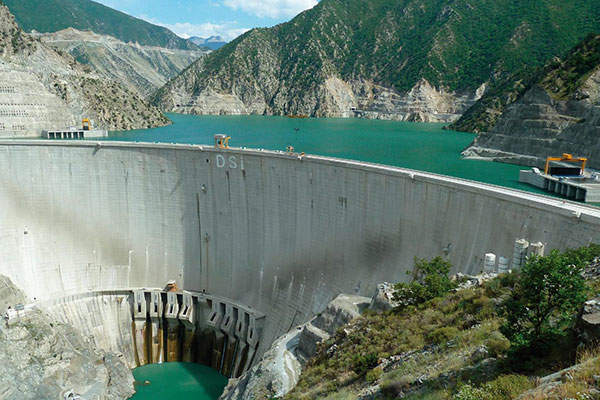 The Deriner dam and power plant is owned and operated by Turkey's General Directorate of State Hydraulic Works (DSI). Image courtesy of Poyry. The dam's eight orifice spillways have a discharge capacity of 7,000m³/s. Image courtesy of Pi Makina. The project’s design phase stretched between 1988 and 1991, the construction of the dam and HEPP was initiated in 1998, the dam filling started in February 2012 and the power station construction was completed in February 2013. 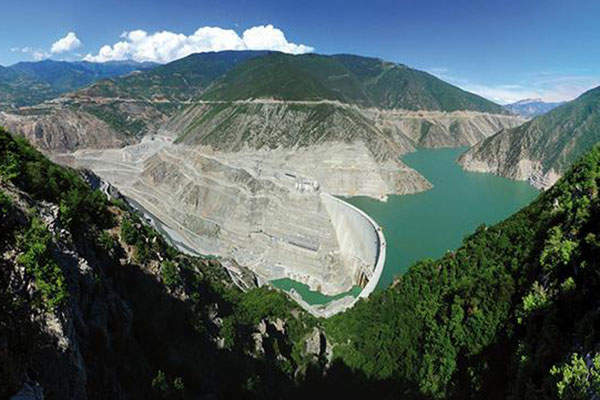 The HEPP has an annual output capacity of 2,118GWh, accounting for approximately 1.1% of the total energy production in Turkey and roughly 6% of Turkey’s hydropower generation capacity. It serves the electricity needs of approximately 750,000 people, while the dam helps in managing flood and sedimentation in the Coruh Valley and provides recreational activities such as boating and fishing. "The HEPP has an annual output capacity of 2,118GWh, accounting for approximately 1.1% of the total energy production in Turkey and roughly 6% of Turkey’s hydropower generation capacity." 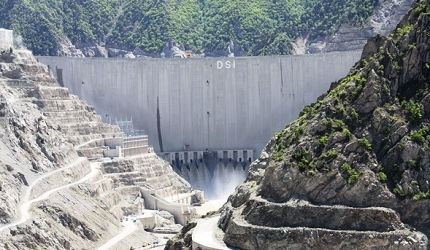 The Deriner dam and power plant is owned and operated by the Turkey’s General Directorate of State Hydraulic Works (DSI). 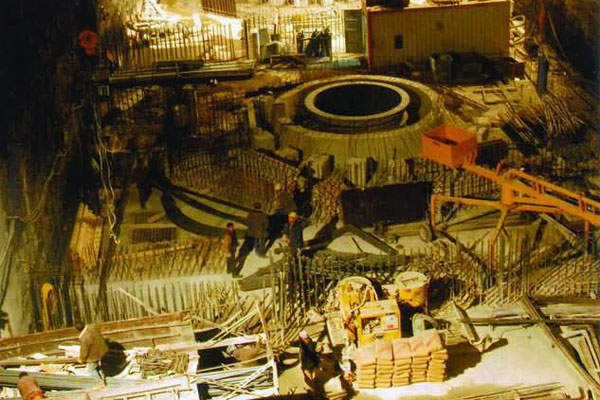 The hydropower project was developed at an estimated cost of approximately $1.4bn. 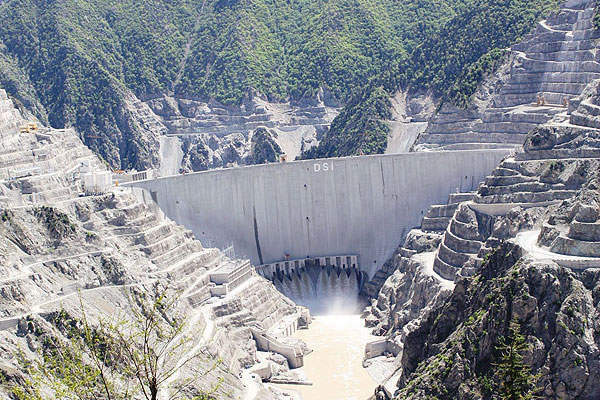 The project primarily involved the construction of the dam’s body, rock excavation, a diversion tunnel, underground powerhouse, overflow and orifice spillways, including associated infrastructure such as access roads, internal roads, tunnels and bridges. Located on the right bank of the Çoruh River, the hydroelectric power plant is 20m-wide, 126m-long and 45m-high. The construction of the underground powerhouse required excavation works up to a depth of approximately 100m. The HEPP is equipped with four vertical Francis turbines of 167.5MW each that are fed with water via a 9m diameter penstock, while water from the turbines is exited via 74m-long tunnels. The double-curvature concrete arch dam is 253m-high from the foundation and 202m from the river bed, making it the tallest dam in Turkey, as well as one of the world’s tallest dams. It has a crest elevation of 397m and crest width between 12m and 18m. The dam Construction involved the pouring of 3.5 million cubic metres of concrete. The dam’s two overflow spillways have a discharge capacity of 2,225m³/s, with tunnel lengths of 420.86m and 446.60m respectively, while the eight orifice spillways have a discharge capacity of 7,000m³/s. The dam’s reservoir has a catchment area of 18,839km², a mean inflow of 154m³/s, a storage volume of 1,969 million cubic metres and a 26.4km² area at full-supply level. The reservoir’s designed full supply level is 392m above sea level (m.a.s.l), maximum flood level is 395m.a.s.l and minimum operating level is 347.83m.a.s.l. 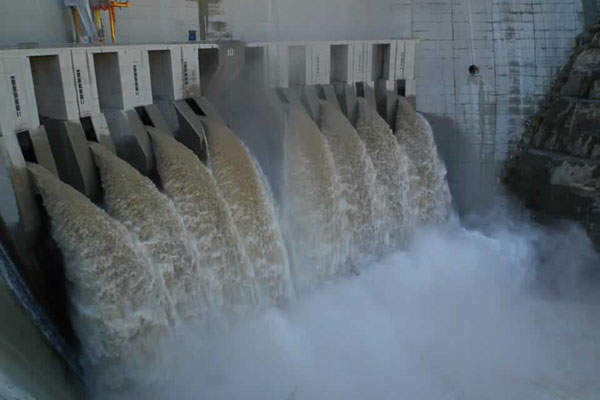 The 11,233MW Belo Monte hydroelectric power plant is a hydropower project that will help Brazil meet its increasing energy needs. The dam construction necessitated a diversion of the Coruh River. The diversion tunnel is a horseshoe cross-section tunnel on the right bank, with an overall length of 912m, a diameter of 11.60m and a diversion capacity of 1,804m³/s. The engineering, procurement and construction (EPC) contractor for the project was a consortium led by ERG. The consortium partners include Technopromexport, Stucky, ABB Alstom Power, and Hydro Vevey (formerly Sulzer Hydro). The dam and the powerhouse were designed by the consortium of Poyry (formerly Electrowatt Engineering) and Dolsar Engineering. The consortium also conducted the project feasibility study and provided quality assurance over the entire construction phase. Andritz Hydro supplied the four vertical Francis units, four 3,600mm inlet valves, turbine governors, cranes and auxiliary equipment for the project. The hydraulic drives and control solution for the spillways were supplied by Bosch Rexroth. An aggregate and concrete preparation plant was constructed by Teknik Yape Proje, while a 360m²/h capacity concrete batching plant was supplied by Pi Makina. Krupp Fördertechnik supplied three cable cranes for the project. Other contractors involved in the project were KPI-JCI, Prokon and Norbert. 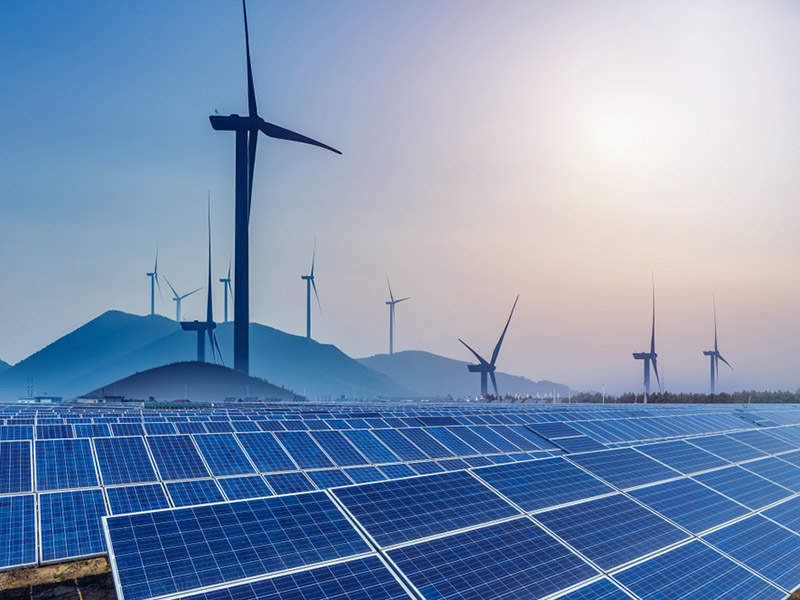 Curtiss-Wright Surface Technologies (CWST) is a global company, which specialises in supplying surface treatments for the renewable energy market.